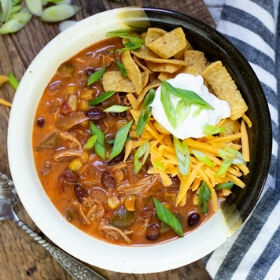 This soup is loaded with classic Mexican flavors of cumin and chili powder along with, black beans, kidney beans and pinto beans (because can you ever really have enough beans?! ), peppers, onions, chicken breast and my secret ingredient – diced chiles in adobo. Combine all ingredients except heavy cream in a large crock pot. Cook on low for 8 hours (or high for 4 hours). Stir in cream and shred chicken with two forks. Garnish with Fritos, cheese, sour cream and green onion. Enjoy!